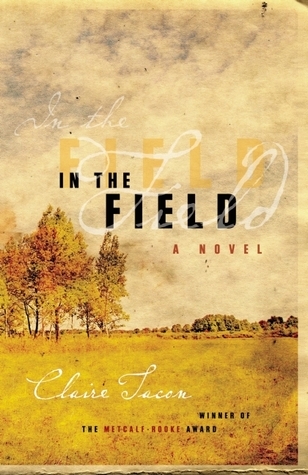 After reading In Search of the Perfect Singing Flamingo, Claire Tacon’s new book, I discovered that she already had a book out called In the Field, published in 2011, and that this book is almost entirely set in rural Nova Scotia. It’s no surprise that I love that this story takes place in Nova Scotia. To be more specific, it’s set in Canning, which is in the Annapolis Valley (and just 5 minutes away from where my parents are currently living). Ellie Lucan grew up in Canning, but since graduating has distanced herself from her teenage years as much as she can. She has a doctorate in soil science, her husband is also a successful academic, and they live in Toronto with their two sons. When Ellie loses her job and finds herself arguing more than usual with Richard, she decides to take her sons and spend the summer with her mother in Nova Scotia. When you come home to a small place after being away for many years, you’re likely to run into people you used to know, and you’re likely to have some memories stirred up (good and bad). Ellie picks up her friendship with Bernie – their boys are both in soccer and get along great. But Ellie’s shaken confidence in her marriage, and Bernie’s inability to let go of the past, mean they enter some rocky territory and have to make some big decisions. I think if I saw Bernie now, it would be like looking straight back to myself at fifteen, all those years I’ve been evolving instantly erased. Beneath that, however, there’s the deeper fear that Bernie’s changed. That I’ve changed. That if we did meet on the street, we’d pass without recognition. Mother/daughter relationship, and the guilt that goes along with it. Since leaving home, Ellie hasn’t spent a lot of time coming back to see her mother, who lives alone and has no other children. Soon after she arrives she notices things that cause her to worry about her mother’s health; a dirty house, sneakers in the fridge, short bouts of confusion. When her mother ends up in the hospital, Ellie feels responsible for her, and plans to stay longer on her own, at the expense of her family, and possibly her marriage. I think about my mother, alone in her new home. After all these years, it seems impossible that I was once inside her, that she carried me for nine months just as I carried the boys. It makes me think about the umbilical cord that attaches mother to child, child to mother. It makes me question in which direction the bond is stronger. Thirty years from now, I’m not convinced that Stephen and Luke would choose to stay with me. I’m not convinced I’d want them to. There are many things going on in this story, but Ellie and Richard’s marriage is at the heart of it. The reader can tell that Ellie and Richard have a good marriage, but the reader can also tell how easy it is for good intentions to turn bad and for misunderstandings to happen, and how it can all snowball. It’s painful to witness. The question of fidelity feels different in this book compared to most scenarios I have read, drawing out conflicting thoughts and emotions. We both huff off to separate edges of the bed. I shift through sleeping positions, vigorous as a yoga instructor. Mostly I want to provoke him so we can finally get through the argument and make up. We never fight for more than a few hours before siting down and figuring things out. All it would take is him agreeing to give up the courses, maybe give me the place to myself for the weekend. I’d rather spend the bulk of the summer here with him and our sons. By quarter past one, he’s already snoring. It kills me that he can sleep. The characters in this book are wonderfully flawed. They all, at some point, will make you angry or disappoint you, while at other times you will understand where they’re coming from or be touched by their kindness. Yet, I was cheering for them all. Overall I would describe In the Field as a quiet novel, but near the end of the book, when everything is coming to a head, Ellie and Richard’s time together feels agonizing. There were only so many pages left in the book, and it didn’t seem like it would be enough for any kind of resolution. The author knew what she was doing, however, and I ended up feeling deeply satisfied. Ellie and Richard’s children, Stephen and Luke, are fully present in this book. They feel the tension between their parents, and Stephen is greatly affected by spending the summer away rather than at home with his own friends and soccer team. They are also children of mixed race, which comes into play when Ellie takes them to Nova Scotia where they stand out more than they did in Toronto. On the other hand, Ellie’s boys (and husband) refer to residents in the Canning area as “hicks” (def. : a person who lives in the country, regarded as being unintelligent or provincial / def. of provincial: an inhabitant of the regions outside the capital city of a country, especially when regarded as unsophisticated or narrow-minded). I don’t like the stereotype that people who live in the country are backward or unintelligent or narrow-minded or use racially inappropriate language. In my experience, people like that can be found anywhere. But when tragedy strikes, we see everyone rising to the occasion – hard feelings are put aside, and the fog that has taken up residence in Ellie’s brain begins to clear. The birds lift off, hundreds of them rising up on some unknown cue, the whole group swarming above me. In flight, the flock squishes and stretches, fans out across the water then curves back over the waves. It’s hard to fathom how so many separate beings can operate as one, their movements so perfectly synchronized that there’s an audible snap as they switch directions, crisp as a flag in the wind. Quiet, entertaining, thought-provoking, and beautifully written. Wow, that sounds like quite the read. Your review really gets to the heart of the story and characters so much so, I feel like I need to go read this one now! Will add it to my wish list for future consideration! Some great quotes, Naomi. This sounds like a particularly satisfying read. Hi Susan! Yes, I loved this book. I was so worried about everybody, especially the kids! This sounds excellent. I like the fact is grounded in very recognisable relationships but the beautiful writing lifts it beyond. That final quote is stunning. I thought it was really well done! True! It was a good exploration of a woman sandwiched between an older generation (her mother) and a younger one (her children). Then there’s her marriage, and her past relationship as well. It seems like a lot, but it’s very realistic! As you can probably guess, I think I would really enjoy this book, simply for it’s focus on marriage. I sound similar to Ellie in that when I do fight with my husband, i wish we could just get it over with and make-up. But, I still think it’s important to fight in a marriage, and get your feelings out there, whatever they may be. The “troubles” Ellie and Richard were having felt so real – it was never anything big… just small stuff accumulating without the ability to get it all out in the open. ah yes, very realistic then! Lovely review, Naomi! This seems like something I would enjoy. I’m glad you felt satisfied by the ending.